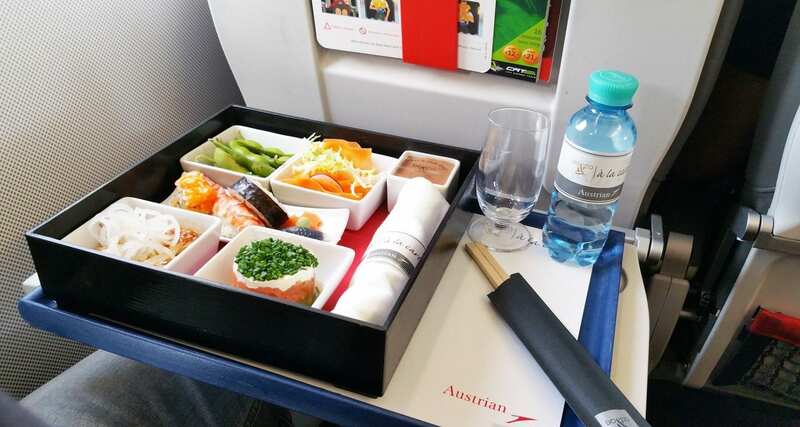 I love Austrian Airlines not only for their fantastic coffee menu (which I am still yet to sample) but the fact that they have these fabulous pre-order upgrade meals for economy class passengers. 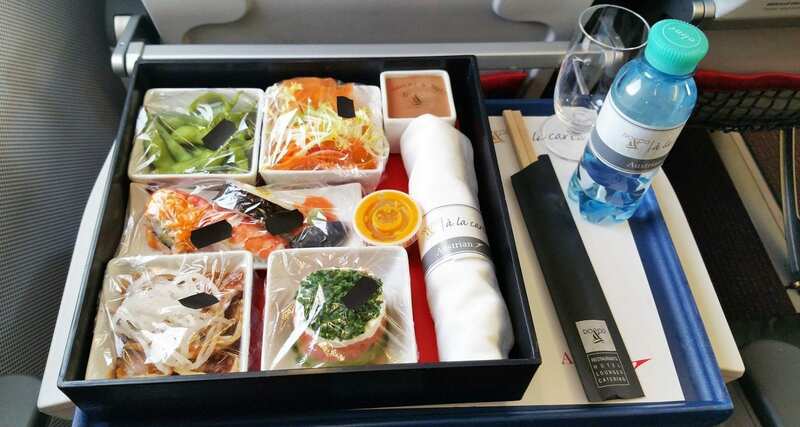 These are some of the best pre-order meals you will get in economy class, without a doubt. The quality of the food is outstanding, the presentation is always on point and most importantly they are all great tasting. Click here to check out their breakfast offering which I have previously reviewed. These meals are available to economy class customer who wish to pay an upgrade fee for these meals. There are a total of 9 meals that you can pre-order on Austrian depending on where you are flying to/from. You can check if your flight is available on this website right here. For this review, we will be looking at the Japanese Bento Box and the famed Schnitzel dish. 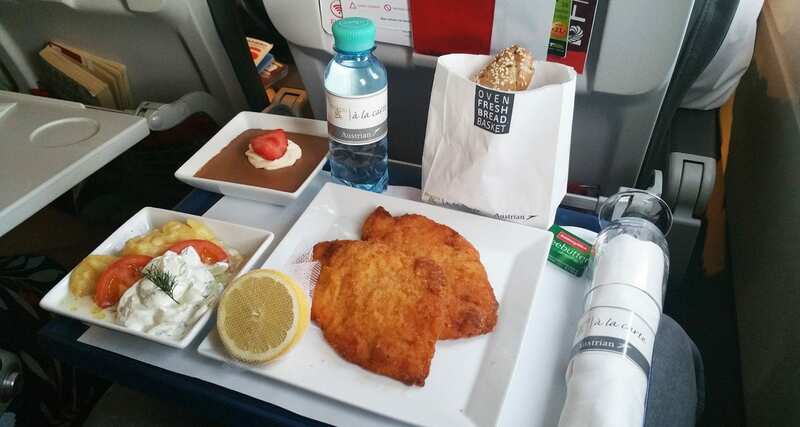 I ordered these meals on two different flights that I took with Austrian. Meal tray delivered! A Japanese bento box consisting of Edamame, Selection of Sushi, Wild Salmon Avocado Tartar with Yuzu Ponzu Dressing, Duck Breast Masao, Sakura Salad, Soy Sauce, Mousse Au Chocolat. All for only €15. When compared to other pre-order meal concepts in the marketplace, these dishes do give you fantastic value for money. I loved this menu; it’s probably one of my favourites and an exceptional culinary experience for economy class. Everything was fresh, presented beautifully and tasted great. Another great dish from Austrian and their catering partner Do&Co. The Schnitzel offering: Deep Fried Chicken, Creamy Cucumber and Potato Salad, Mousse Au Chocolat and fresh bread. So much attention to detail here. Notice the proper glass in economy class? Notice the lace covering the lemon, so you only get the juice on your meal, don’t you love the bread bag, like it’s come straight from the local baker. I thoroughly enjoyed this meal, very tasty, and the chicken schnitzel was excellent.